← What’s in a (Hobbit) Name? Traditions come to the fore when family gets together on holidays. Like you, we have ours. Long-loved practices we cannot wait to practice again. As usual, our Thanksgiving table was set in splendor, designed by my daughter, Heidi, who makes everything beautiful. Fresh flowers in silver vases, chargers giving the plates even more importance, flickering candles, and lacy leaves scattered about. She added our usual name-tags, each decorated with fall cutouts and personalized with winsome descriptions: Extraordinary Eric, Debonair Dietmar, Exquisite Essie, Magical Maya, Sweet Sidney, and more. Mine was Creative Cathy. Though Heidi was really the creative one. 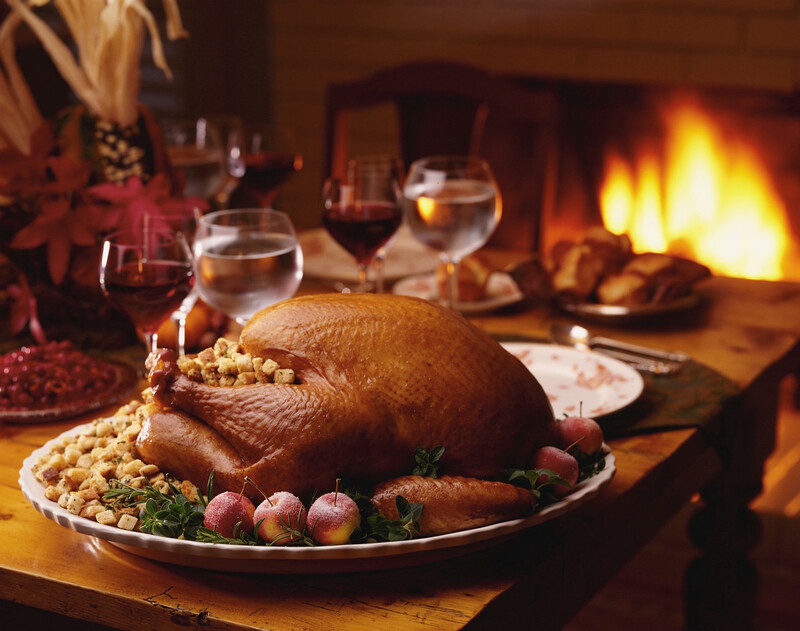 In the kitchen, my son-in-law Eric sliced the plump turkey he had cooked; the aroma told us dinner was ready. Soon we stood around the table, holding hands, one by one expressing the gratitude in our hearts. After giving thanks, we tucked in, enjoying our traditional dishes, turkey and dressing, mashed potatoes and gravy, cranberry sauce, fresh green salad, corn pudding, Parmesan asparagus, grilled artichoke hearts, and Marcia’s famous Jell-O. Once we relaxed with pumpkin and apple pie, sipping coffee and cranberry-apple cider, Heidi announced a new tradition for us to practice. Recently, she had seen a moving video of wounded soldiers, in hospital, lonely and away from home for the holidays. Yet cheered by Christmas cards sent from their grateful countrymen. And their country’s children. Six-year-old Sidney made a great sign for us. What a great idea for us, Heidi thought. We could make our own cards! So in preparation, she spent many evenings at work on her Cricut, cutting out cards and ho-ho-ho designs.She gathered up festive stickers and colored pens. 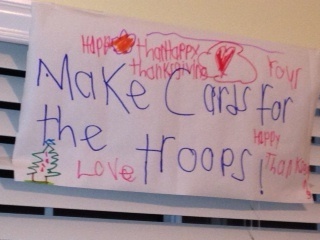 On Thanksgiving day, she asked her wee daughter to make a sign to hang over the kitchen table. The children got busy and made a couple cards each. The Kids Got to Work! Their messages were strangely mature in spite of their youth. Full of respect and gratitude. Though my two-year-old grandson went wild slapping happy Santas and candy cane stickers all over his card, inside and out. 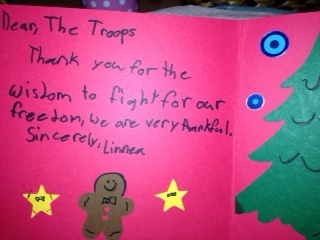 Basket of Cards for the Troops. 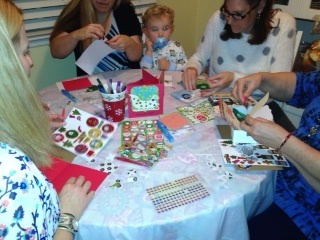 Soon the adults took over the table and made more cards. We didn’t stop until we ran out of card stock and filled a basket with our warm wishes. I hope we do it every Thanksgiving. A new tradition, worthy of much practice. What a lovely family Thanksgiving dinner your daughter set. It sounds like a photograph in a decorator magazine! 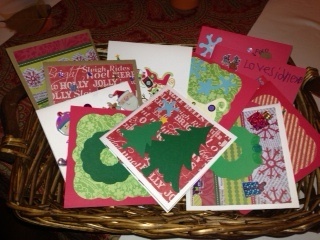 And I love your new tradition to make and send cards to the wounded troops in hospitals. The pictures of your family making the cards give such a beautiful visual of hearts at work for strangers, fellow countrymen and women who gave in the line of duty, so we could still celebrate Thanksgiving! Thank you, Kathy, for the kinds words. It was my favorite table of all her lovely settings. Unbelievably, I didn’t take a picture of it. 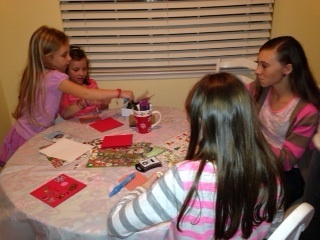 But was quick to photograph the kiddos making cards, etc. And I agree, it is because of our hero-soldiers that we can celebrate any holiday in freedom. What a delightful and precious Thanksgiving tradition! Loved all the great photos too!! Thanks for sharing, Cathy. Thank YOU for dropping by, Kateness. I did notice that you posted the Holiday Mail address on FB first. 🙂 There we go again! Sharin’ the heart.